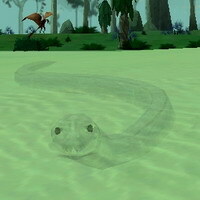 6:44:00 PM These are the most amazing looking snakes in SWG. They're transparent and they're huge. 2:07:00 PM I got one because I like how they look. Not bad resistances across the board, but not great either. In PvP can be difficult for your opponent to see. 5:16:00 AM If you press Peace before taming a creature, you won't fight back if it attacks you. 2:34:00 AM An intimidating looking pet but overall, not a favorite of mine. Despite the lower HAM I like Merek Assassins better. 6:54:00 PM Got a pair I've named Ying and Yang. They do really well as a team for my hunting. 1:43:00 PM The strong poison combined with their transparency (which makes them tough to see in some environments) make these wonderful PvP pets. Their HAM vs Kinetic is a little low for a solid PvE pet, but when I pull this guy out in PvP I almost never lose a 1 on 1 (or even 1 on 2) fight. 2:07:00 AM I might be temporarily but I bump into these quite often when I'm commuting between the Labor Oupost and the Geonosian Cave. I regularly bump into a baby too. 7:56:00 PM I've seen some of these (as pets) and they're not kidding about the "giant" part!